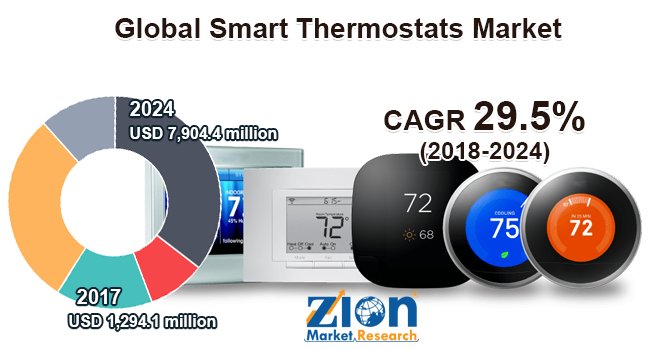 Zion Market Research has published a new report titled “Smart Thermostats Market by Components (Display, Temperature Sensor, Humidity Sensor, Motion Sensor, and Others), by Network Technology (Wired Networking and Wireless Network), by Application (Residential, Commercial, Industrial and Other Applications): Global Industry Perspective, Comprehensive Analysis and Forecast, 2017 - 2024”. According to the report, the global smart thermostats market accounted for USD 1,294.1 million in 2017 and is expected to reach USD 7,904.4 million by 2024, growing at a CAGR of around 29.5% between 2018 and 2024. Smart thermostats help users to change several thermostat settings from their smartphone and, in some cases, a computer and web browser or with user’s voice using a device such as the Amazon Echo. The growth of global smart thermostats market is primarily attributed to increasing awareness of energy management paired with advancement in technology. Furthermore, the growth of the smart home market, need for remote access solutions to monitor and control the energy consumption, rising energy prices are some of the key factors expected to propel the market growth in the forecast period. Availability of well-positioned apps for operating different systems is assisting the adoption of the smart thermostats. However, data security concerns and the high initial cost of devices are some factors estimated to hamper the smart thermostats market growth. Nonetheless, availability of configurable and reconfigurable thermostats and raising awareness of energy saving and power are the factors expected to open up significant growth opportunities for the smart thermostats market in the years to come. Components segment is fragmented into motion sensor, display, humidity sensor, temperature sensor, and others. The temperature sensor is expected to become the most attractive components segment in the year to come due to development of sensor technology. Display components segment is also expected to favor the market growth in the near future. Wireless network emerged as a leading network technology for smart thermostats in 2017 & accounted for over 68.07% of the market share. Wi-Fi and ZigBee network technology are predicted to spur the growth of this network technology massively. Easy mode of implementation and operation is expected to further flourish the demand for wireless network significantly. The residential application is expected to be the fastest growing segment and held the largest market share, owing to the increase in demand for smart homes, and connected homes, home automation technologies, and growing awareness about energy saving devices among consumers. Use of smart thermostat in the industrial sector is also rising as this technology is being opted at all levels from warehouses to the assembly line. North America was the dominant market for smart thermostats market in 2017. Massive penetration of smart home, high demand for managing energy consumption solutions, high disposal income, and high-technology adoption rate are primary driving factors for the smart thermostat market in North America. Europe is estimated to grow at the highest CAGR for the smart thermostat market in the forecast period. Further, increasing awareness of energy management coupled with rising disposable income is expected to drive the growth of Asia Pacific smart thermostat market. Japan, China, and South Korea are expected to be the key lucrative market for the smart thermostat in the analysis period in the Asia Pacific region. Some of the major players in the smart thermostats market are Honeywell International Inc., Schneider Electric, Ecobee, Inc., Tado GmbH, Control4 Corporation, Ingersoll Rand Plc, Nortek, Inc., Nest Labs, Inc., Emerson Electric Co., and Carrier Corporation, among others.